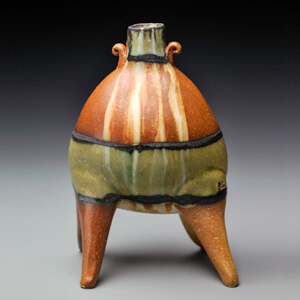 Suze Lindsay is a studio potter living and working in the western NC Mountains. Her ceramic studies include a two-year fellowship from 1987-89 at Penland School of Crafts as a “core student”, followed by earning an MFA from Louisiana State University. She also holds two educational degrees, one in special education and the other in Montessori teaching theory. In 1996, after completing three years as an artist in residence at Penland, Suze and her husband, potter Kent McLaughlin, set up and began potting in their studio in Bakersville, NC under the name Fork Mountain Pottery. Suze’s stoneware pots subtly suggest figure and character that she manipulates into her forms by altering them after they are thrown. Hand-built elements, made from slabs, are integrated with thrown parts to create functional forms that have a personality of their own. An integral part of her work includes surface decoration that enhances her forms by patterning and painting slips and glazes then once-firing in her salt kiln. Her work is strongly influenced by studying historical ceramics, and she frequently references contemporary pottery ”heroes” who were her teachers, mentors and friends. Suze has taught at numerous art centers and universities including Haystack Mountain School of Crafts, Penland School of Crafts, Arrowmont School of Arts and Crafts, Anderson Ranch Art Center, Nova Scotia School of Art and Design, Metchosin International Summer School of the Arts- Canada, Jingdezhen Ceramic Institute- China, Curaumilla Art Center- Chile, Tulane University, and Ohio University. She has been a presenter at the Utilitarian Clay Conference in Tennessee, the Alabama Clay Conference, North Country Studio Conference in Vermont, and Fusion-Ontario Clay and Glass Association Conference in Toronto. Awards include Best of Show in the First Annual Strictly Functional Pottery National, and Emerging Artist at the 2000 National Council on Education for the Ceramic Art conference. Her work is in the permanent collections of George E Ohr Museum in Biloxi MS; Taipei County Yingge Ceramics Museum, Taipei, Taiwan; San Angelo Museum of Fine Arts, San Angelo, TX; Islip Art Museum, NY; Kennedy Museum of American Art, Athens OH; Greenwich House Pottery, NY; Lancaster Museum of Art, East Petersburg, PA; Rocky Mount Arts Center, Raleigh, NC, and the North Carolina Potter Center, Seagrove, NC. Recent solo exhibitions include exhibitions at Manchester Craftsman’s Guild in Pittsburgh PA, North Carolina Pottery Center in Seagrove NC, Roswell Art Center in Atlanta, GA, 18 Hands Gallery in Houston TX, and AKAR Gallery in Iowa City, IA. I focus on creating altered pottery forms that are good companions for daily use. An integral part of my work includes surface decoration to enhance pottery form by patterning and painting slips and glazes for salt firing. I make things to entice the user to take pleasure in everyday activities, inviting participation, promoting hospitality. When I make pots, I subtly suggest figure and character by manipulating forms after they are thrown. I roll out clay slabs and use them to hand build elements that are then assembled with thrown parts to create pieces that have a personality of their own. I like to experiment and play with form and proportion on functional ware by altering and stacking parts. When I decorate the surfaces with slips and glazes, I am very interested in making the marks and designs enhance the volume of each pot. I am inspired when I see historical pots from many cultures, including Japan, Crete, Chile, China, and native North American. The pots I respond to may be a quirky Pre-Columbian animal ewer, or the sophisticated designs of a Mimbres bowl.